Chronic pain is nearly always a habit in the nervous system. Acute pain is an interpretation of nociceptive signals indicating tissue damage and inflammation. The tissues optimise the local repairs after a few months, so if the experience of pain persists then it is far more likely your central nervous system still frames the region initially damaged as unsafe in some way. 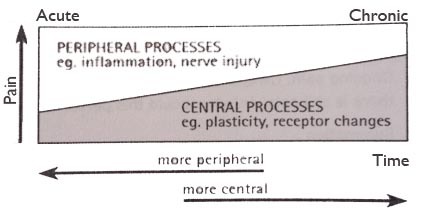 Here is a really nice graph (adapted from a NOI group training manual) giving some sense of the shift from tissue damage making up 3/4 of the pain experience in acute pain, to central processing making up 3/4 of the pain experience in chronic pain. Here is a video describing how brain changes can be seen in chronic pain patients on MRI scans. Wild stuff, pain is very strange, and not what I was taught at chiropractic college.